The new Moto G6 are official, there's no more secrets! Motorola has officially launched its new range of low and mid-range smartphones today in Sao Paulo, Brazil. The new Moto G range is its seventh generation, which began 5 years ago. This year, three models have been announced, but we're yet to find out if these will land stateside. Here's everything we know about the three models, Moto G6, Moto G6 Plus and Moto G6 Play. Moto G5 vs Moto G5 Plus: What are the differences between the models? What are Motorola's biggest mistakes? The Moto G6, G6 Plus and G6 Play have almost no secrets anymore. Motorola has opted for the 18:9 display format, however, it hasn't decided not to follow the current trend: none of the three models offer the notch, which some of you will be pleased to see! Moto G must deliver maximum technology at an affordable price, as this is the brand's promise. The design has never been a strong point, but the brand has offered some elegant-looking phones more recently. In 2017, for example, the Moto G5 were the first in their family to use aluminium. This year, we continue get more quality materials, with a look that reminds us of the Moto X4. As with the Moto G6 Plus, there is a double camera and curved glass on the back that gives it a look that's worthy of a higher range. On the front we have the fingerprint sensor and the brand logo on the lower bezel. The main difference between the Moto G6 and the Plus version is the screen size, which has been reduced to 5.7 inches in the standard version. It will be available in pink, black and silver from next May at a price of 249 euros. We don't yet have a price for the US but at an estimate, it will be around $300. What does the Plus version have to offer? We're unsure whether the G6 Plus will arrive stateside, but it will be available in Europe for 299. The Moto G6 Plus has many elements that the Moto X has. Again on the back, there's a double camera and a glass finish. The main thing here is its 18:9 format, which stylizes the camera and makes it more elongated, as well as making it easier to handle. The diagonal measurement of the screen here is 5.9 inches. This new display is called Max Vision and has reduced bezels on the sides. Again, on the lower bezel at the front, is the Motorola logo and a fingerprint sensor. The upper front of the device is has been reduced the most and is a little bit like the Moto X Force of 2015. This version will be available in dark blue, black and silver. Moto G6 Play: is the budget version an attractive option? The Moto G6 Play is the cheapest of the three models but it's definitely the one which will offer the best battery life. The back is not made out of glass, but it does keep the same Max Vision screen with 5.7 inches and 18:9 ratio. The definition is however lower than the other two devices, and the fingerprint reader for this model is located on the back. Here we also see a round camera module as with the other Moto models, but the G6 Play only has a single camera. We're still to receive any news regarding a US release, but the phone will be released in Europe during the first week of May at 199 Euros (around $240), available in Charcoal, Dark Blue and Gold. What can we expect performance wise? The new Moto G6 and Moto G6 Plus have a lot in common, although the Plus model justifies its higher price with better specs. Let's start with what they share: both devices offer a USB Type C plug and water protection. In addition, both cameras are able to recognize landscapes and objects. In the Moto G6, video reaches 1080p at 60 fps while the Moto G6 Plus reaches a 4K resolution. The Plus version also supports Bluetooth 5.0, while the other two settle for Bluetooth 4.2. The G6 family have Motorola's TurboPower fast charge and include a compatible charger in their cases (for the Moto G6 Play, the connector is micro USB). All three devices have Android 8.0 Oreo (too bad that Motorola opts for this version and not the 8.1). As we mentioned, we don't know anything yet about the release date or price for the US, so we can only go with the estimates we've made in this article for now. As always, we'll keep you updated as soon as we know more. 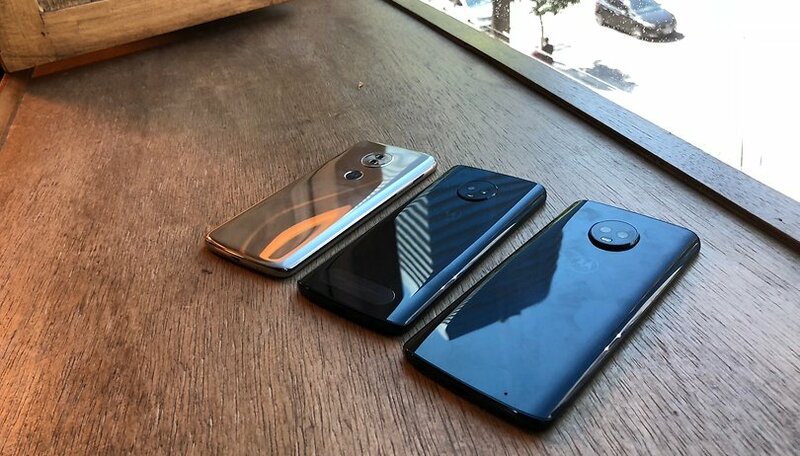 Overall, despite the 18:9 format, Motorola was expected to do a little more, especially as the competition in this category is getting tougher and more complicated. In any case, the phones should attract a loyal audience. What do you think so far? Leave a comment. Ugh another glass backed copycat phone. The g series was a tough phone but not any longer. Now it's another fragile glossy piece of stupid.